South Korea’s KB Financial Group Inc. reported its full-year bottom line exceeded 3 trillion won ($2.67 billion) for two straight years in 2018, but the result was lower than the previous year due to a rise in spending for general expenses and growing operating losses in the final quarter. KB Financial Group said in a regulatory filing on Friday that it posted a net profit of 200.1 billion won on a consolidated basis for the fourth quarter ended December, down 79.0 percent from the previous quarter and 63.8 percent from a year ago. KB Financial Group’s fourth-quarter bottom line plunged due to increased spending on general expenses, including 215.3 billion won paid out to employees who applied for voluntary retirement and 134.1 billion won paid out as special bonuses upon collective wage agreement with its labor union. KB Financial Group’s operating loss also expanded in the fourth quarter due to the bearish stock market and sluggish damage insurance business. 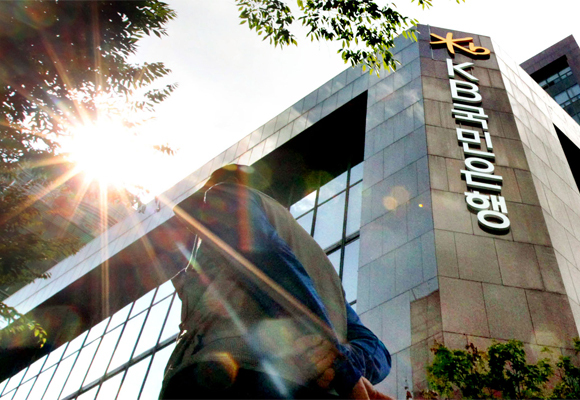 Shares of KB Financial Group ended 0.1 percent higher on Friday at 48,100 won. For full 2018, KB Financial Group said it raised 3.07 trillion won in net profit, down 7.3 percent from a year earlier, but the bottom line exceeded 3 trillion won for the second year in a row, the first since it transformed into a holding company structure. In 2017, KB Financial Group raised 3.3 trillion won in net income. KB Financial Group’s total asset last year jumped 9.8 percent from the previous year to 479.6 trillion won. Its asset quality also improved with the non-performing loan ratio falling 0.08 percentage point to 0.61 percent during the same period. The group’s flagship lender KB Kookmin Bank saw its net profit jump 2.3 percent to 2.2 trillion won last year from a year earlier. The lender’s net income margin fell 2 basis points to 1.7 percent in the fourth quarter ended December from the previous three months due to the increased burden on purchasing cost amid a rise in fixed deposits. KB Kookmin Bank’s won-denominated loans increased 9.6 percent year on year to 257.4 trillion won as of the end of last year. KB Kookmin Card raised 329.2 billion won in net income last year, up 10.9 percent from a year ago upon reflecting one-time profit following the sale of its stake in Korea Asset Management Corp. despite deteriorated operating conditions such as lower commissions. KB Securities Co. reported a 34.2 percent on-year plunge in net profit to 178.8 billion won last year due to increased management losses from stocks and exchange-traded funds. KB Insurance Co.’s net income also plunged 20.6 percent to 262.3 billion won during the same period due to a rise in the loss ratio of long-term insurance and car insurance.